This is the longest joke in the world. Odds are, you fit in with the 56% of readers who scroll to the end within the first 20 seconds. Or maybe you are with the 33%ers who read ⅓ of it, debate reading on, then scroll to the end of the joke. And no, we won’t tell you the punch line. It’s a humorous personality test of sorts. This long-winded joke was the subject of an Educational Psychology Master’s Thesis, revealing that only 11% of readers read the whole joke, and even enjoyed the build-up to the punch line. 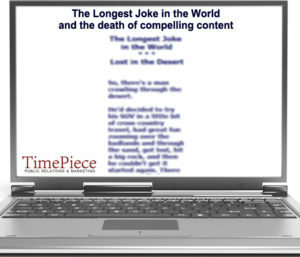 In the same way that we can’t sit down and muster up enough concentration to finish a long joke, online content often can’t retain our short attention spans. If it’s not over in 4 seconds, it’s not worth our time. After all, it fills our hearts with joy when the “Skip Ad” button pops up on YouTube to rescue us from wasting 30 seconds of our lives. Washington Post just released an article revealing that 59% of links shared haven’t been clicked on. So if half of internet-perusers are mindlessly sharing who-knows-what article their aunt’s cousin’s friend sent them a link to, how do we stand out amid the content overload? How do we compete with the high-speed, get-it-done mindset? Why even write this blog? The answer: We have a strategy. Average readers give a story about 10 seconds to decide if it’s worth reading. We at TPRM can make the most of that 10 seconds. We are highly skilled at pulling readers in past the headline, past the first sentence, past the summary. If you need a blog makeover, we use a working combination of high SEO keywords, well-developed stories, and captivating headlines for your targeted audience. For your website, we use stunning design elements to get visitors hooked and coming back for more. Let us make your news releases newsworthy and your social media magnifying. Write for more than 11%ers with our effective digital marketing strategies and contact us today at LetsTalk@TPRM.com.